Release Date: April 27th, 2007 (Landmark Sunshine Cinemas and Lincoln Plaza Cinemas) by Sony Pictures Classics. 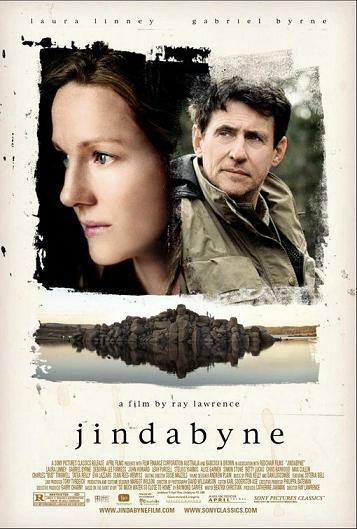 The Cast: Laura Linney, Gabriel Byrne, Deborra-lee Furness, John Howard, Leah Purcell, Stelios Yiakmis, Simon Stone. BASIC PREMISE: Stewart (Byrne) and his friends discover a dead body of an Aboriginal girl in a lake, and continue to go fishing, which angers their hometown of Jindabyne. ENTERTAINMENT VALUE: Jindabyne has very little drama and not enough suspense, especially given that the identity of the actual murderer is revealed in the opening scenes. Stewart and his three friends go fishing just like they always do, but, this time, they discover the corpse of the murdered Aboriginal girl floating on the lake. Instead of reporting it to authorities immediately, they merely tie her legs to a tree so that she won’t wash away with the tide. When they return to their hometown of Jindabyne in Austrialia, they only report it a few days later. The rest of the dull, meandering plot focuses on how this carelessness affects the Stewart and his wife, Claire (Linney), while the rest of the town looks down upon them. Unfortunately, screenwriter Beatrix Christian fails to bring any of these scenes to life and doesn’t include enough character development. Even the initially promising subplot, involving the murderer who remains on the loose, lacks any tension. Gabriel Bryne and Laura Linney both give convincing performances, yet they simply don’t have a good enough script to shine—especially Laura Linney, who was excellent in the indie gem You Can Count on Me. Director Ray Lawrence tries his best to create an eerie atmosphere with the cinemography and scenery, but that doesn’t help to make you feel absorbed or compelled. SPIRITUAL VALUE: The fact that the four men neglected the dead body while they continued to go fishing strongly suggests that their inaction is unethical and immoral. However, it’s not easy to conclude that it makes them evil or amoral people in the strictest sense. They made a stupid, careless mistake which is even more surprising given that they’re all adults rather than a group of teenagers. Jindabyne doesn’t really explore these themes profoundly enough, but at least it consider them. INSULT TO YOUR INTELLIGENCE: Often meandering and dull. IN A NUTSHELL: Atmospheric scenery and decent performances, but often meandering and dull.